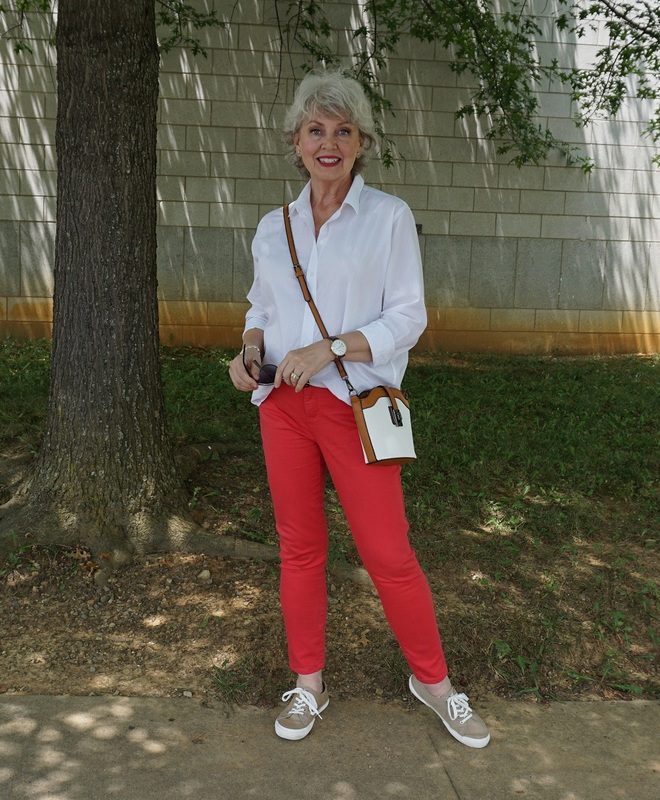 When I added the Chico’s color ‘Malibu Punch‘ to my wardrobe in the spring, I knew exactly how it would perform with the main colors and neutrals in my closet. That’s what accent colors do. They are team players that work well with others. The bright girlfriend ankle jeans help to create a fun casual look when paired with a plain white shirt and sneakers. The crossbody bag and leather band watch add to the relaxed vibe of the Sunday afternoon look. 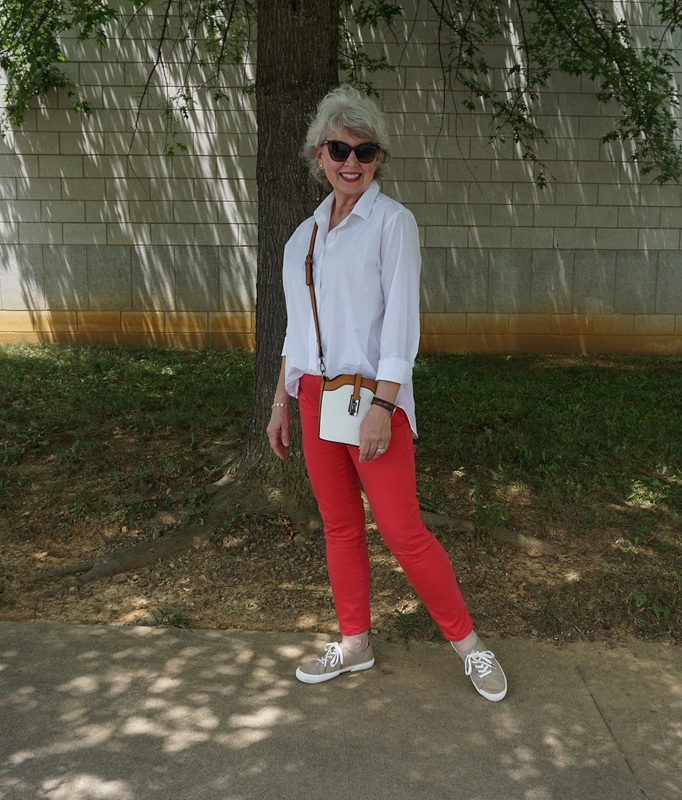 The whisper thin white striped relaxed cotton shirt is from Everlane here. The crossbody bag is a no name inexpensive one from a gift shop, similar here. The khaki sneakers are by Ralph Lauren, similar here. The large face watch with a leather band is a few years old. Similar watch here. When I wear one of the Malibu Punch items, I always pair it with neutral or main colors, never another accent color. For example, if I had worn my aqua top from the post here with these jeans, it would have created a look that is too bold and in your face for me. 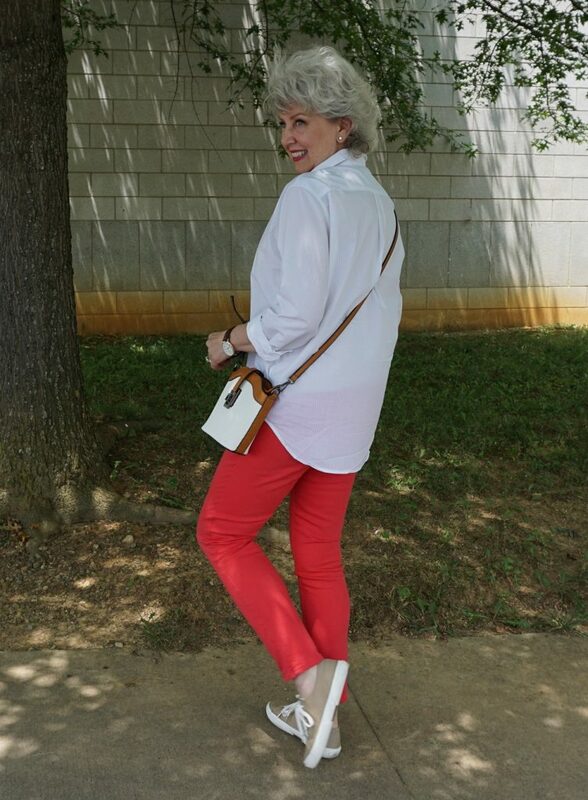 Anchoring a bright color with a solid neutral makes it more compatible with my classic style. I also wear these jeans with tops or jackets in navy, denim blue or black for example. My wardrobe consists of the three main colors of navy, gray and denim blue. My two neutral colors are white and black. The four accent colors are red, royal, turquoise, and coral. The main colors and the neutral colors all work together or with any one of the accent colors. Thanks for the color recipe break down!!! So helpful. Have a wonderful day! You mentioned that the top is “whisper thin.” What do you do about the sheerness of the fabric? Do you wear a white tank top underneath it, or is it appropriate to just wear the top as it is? I have several sheer white cotton summer tops, and I am confused about how to wear them. The shirt is slightly sheer, so I am wearing my Ultimate Shapeez bra. The bottom edge is over the top of the pants in the back but tucked in at the front. I always feel fully dressed when I wear one of those bras even if the top I am wearing over it is sheer. I do love these bright colors. I am definitely drawn to them even more than the neutrals. In fact, I just wore my dress in this color with turquoise accents!! Definitely bright and obvious, but then again, life’s too short not to have fun with colors. I love that you put some thought into your outfits even for a walk like this, Susan. It’s so nice to see people taking pride in their appearance! I really like the Malibu Punch! Wish I had gotten some of it when you first showcased it! It’s getting difficult to find in many sizes now on the website…maybe I’ll check in the store! Thanks for your posts! Your style really makes sense for me and I love it! 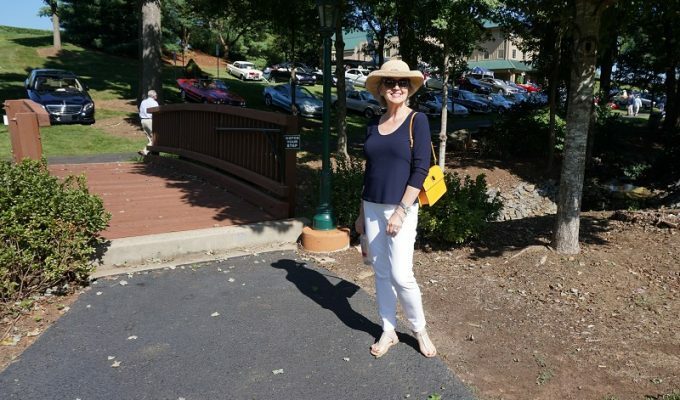 I find wearing blouses tucked in the front not flattering for me. It emphasizes my tummy! I’m hoping this is a style that will go away soon! Love this post. So informative. I try to follow it as it does create more outfits from what’s in the closet. I’m 73 now (a young 73!) and realized when I was about 60 that I cannot wear flowery prints anymore around my face. Looks ridiculous on me. I’m much better in solid colors. Probably because I weigh more and flowery prints make you look HUGE. However, I’m plagued with still purchasing flowery tops once in awhile and then never wearing them. Old habits die hard. Ugh! Ha ha!!! Thanks for keeping us informed. I look forward to your blog every day. I love this look on you!!! Fun, relaxed and youthful!!! Love your fun expression on these pics. This is a question about shoes. I am 63 and have issues from arthritis. I have several occasions a month when I need to dress up but am having a hard time wearing heels. I would love to know your thoughts on comfortable dressy shoes please. The most comfortable shoes are often clunky looking. Try to find more slender shoes with a low block heel, even two inches will seem dressed up. Try the Rockport brand. I just bought a good looking pump from them with pointed toes and a block heel which is very comfortable. I purchased the Malibu Punch jeans and tunic also! I have been wearing both on repeat all spring and summer. 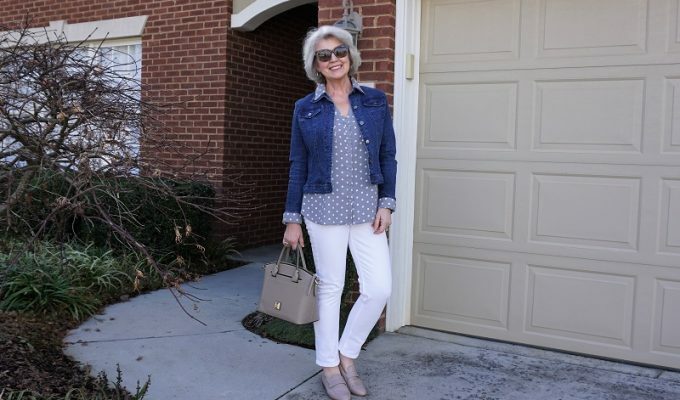 I wear the jeans with neutral basics like you, and the tunic with white, dark blue, or black jeans or slacks. I often add a scarf that picks up the color! 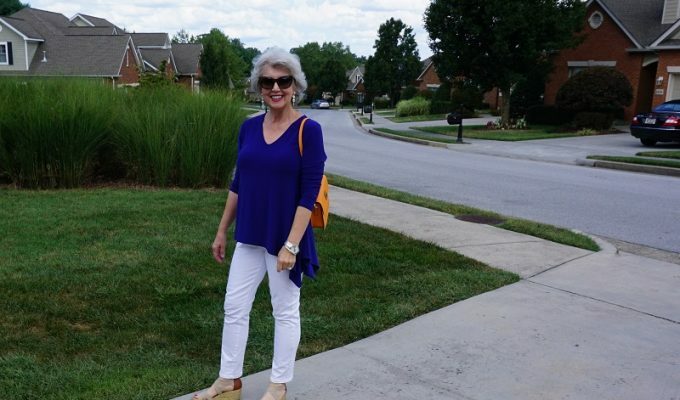 I did not purchase the aqua tunic (wish I had), but I did purchase the linen shirt in that color. Living in Las Vegas, I have found that linen pieces are critical to surviving the summer heat. So I have purchased some linen pants, a few linen shirts, and two linen/cotton tees, and a linen dress to round out my summer wardrobe. These and a couple of jersey dresses get me through summer. Coral and turquoise/aqua are two colors that I have bought in a few pieces to add some color; as you have pointed out coral and turquoise are universally flattering. I like coral year round and love turquoise and aqua in the summer as they remind me of water and tropical destinations. I have a few other colors that I buy like pink, red, and burgundy and cobalt and royal blue. My basics – slacks, skirts, dresses, turtlenecks, tanks, tees, and other tops — are mostly neutrals as I get the most wear from these. I have learned a lot from you and I am always refining my wardrobe. Your blog has lots of great advice! looking forward to your new tips. Jeannette: Try an asymmetrical tuck. Instead of centered as Susan is showing it here, align it almost over to one hip. The diagonal line created will still give a leg lengthening effect, while disecting the lower tummy area to distract from it. Sharon, that sounds wonderful. Can you provide a visual of this idea? Love the Malibu Punch color! I’m a big fan of your blog but have only commented once before. I live in Sydney Australia where we are currently experiencing winter (very mild in comparison to yours – today reached 74F but usually the winter range is 45-60F!). I’m planning my packing list for a 3-week holiday to New Zealand in December (spring/summer but potentially 4 seasons in a day and much cooler than Sydney) and I’m finding your current summer posts and recent holiday packing ideas very helpful. I have a slightly “indelicate” question about tank tops which I love to wear under shirts. I find that I must wash any clothing worn in direct contact with my body after wearing it once, so tank tops always need to be laundered after wearing for a day as do any tops worn over a tank or directly in contact with the body. I notice you often wear jackets over a tank top, so I assume the jacket underarms are in direct contact with your body and I wonder how you deal with this issue? Are your jackets easily laundered or do they need dry cleaning? I have read many ideas to protect the jacket (which I thought were possible but potentially disastrous!). I would love to hear your ideas! I hang my jackets to air out after every wearing and launder or machine wash as needed. I am mostly cold natured, so I rarely perspire.